Learn how to recognize the signs and symptoms of an allergic reaction so that you can give life-saving treatment early. Do not ignore early symptoms. Always take a possible reaction seriously and act quickly. A child may describe their symptoms differently than an adult: for example “my throat is tingly” or “my tongue feels scratchy”. An allergic reaction usually happens within minutes after being exposed to an allergen, but sometimes it can take place several hours after exposure. Symptoms and severity of a reaction can differ each time. 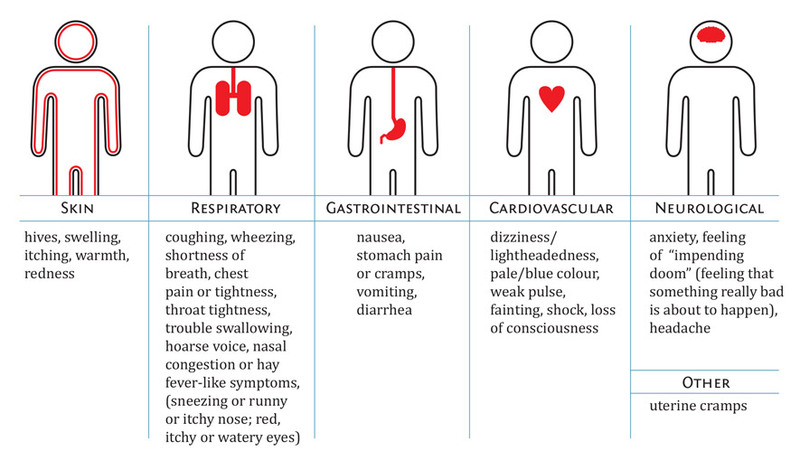 Keep in mind that an allergic reaction can start with mild symptoms that can get worse quickly. Make sure to talk to your doctor about how to recognize anaphylaxis. Trouble breathing caused by swelling of the airways (including a severe asthma attack for people who have asthma). Both can lead to death if untreated. It is not possible to predict the severity of an allergic reaction. Don’t ignore early symptoms, even if they seem mild, especially if you have had a reaction in the past. Small children can have a hard time describing their symptoms. They may complain of a “funny feeling” in their mouth or throat. Or, they may say things like “my mouth feels funny” or “my tongue is itchy”. Next, visit our Treating reactions page to learn how to treat allergic reactions.